Today's the day! Happy Diaversary to Sweetpea! It's kind of hard to believe that it's been a year.... And it's kind of hard to believe that it's ONLY been a year! It's been one of those years! I know some people choose not to acknowledge or celebrate this day. Trust me. I understand. I get it. Yeah, it was unquestionably the WORST day of my life. However, it was also the BEST day. No, I have not totally lost my mind. Yes, I did just say that dx day was the best day of my life. Why would say such an incredible and ridiculous thing? Because. Without dx day, Sweetpea would not be alive today. She would have kept getting sicker and sicker. She would have starved to death. She would have kept throwing up. She might have gone into a coma. She would have died. It was only a matter of time. So, It was the day she was diagnosed and the day that her life was SAVED. That's a great reason to celebrate! We also choose to celebrate this day as a way of thumbing our noses at D and saying, "you give us this disease? FINE. But I will NOT cower on this day. I will PRAISE!". It's a great opportunity for us to acknowledge all we've been through as a family and all Sweetpea has been through as a child with diabetes. It's a way of celebrating her bravery, her courage, and her strength. But we HAVE come a long, long way together. And we will continue to CELEBRATE and PRAISE! So, without further ado, here is the project J and I have been working on.... Enjoy! Ok- It's time to get your party on! Let's CELEBRATE!!! One year ago. It was a beautiful day. It was the first warm, really warm, day of the season. We decided to go to the zoo! We got up and got dressed and headed off. We stopped at Tim Horton's to get a "special" treat for the road. Oj and donuts. What a combo. We had no idea that this was the probably the WORST thing we could have chosen. But once we got there, she got grumpy. She hardly had any interest in looking at animals. She would want to go see one and then once there decide she wanted to look at something else. She wanted to be carried. She had a minor meltdown on the train. She was hungry. We got pizza. GOOD pizza. She refused to eat. She was hot and sweaty. She wanted to go home. She cried. Later that night, she threw up. But in the morning, she seemed better. No fever. More energy. It was another beautiful day! We went to the park. She wanted to be carried. She refused to play. She said she just wanted to go home. Odd. We thought it was just some bug she had caught. J and I went to bible study that night. My parents had just gotten home from Florida the day before. They came over to stay with her. She seemed happier. She seemed fine. We were enjoying a relaxing evening with friends. Sitting out on the back deck, enjoying the warmth of the evening and the company of good fellowship. The phone rang. It was my Mom. "You need to come home" she said. "Something's not right. Sweetpea's in pain. She's crying. She's saying her tummy hurts. She doesn't want us to touch her." We found Sweetpea and my parents in her room. Mom said she had been playing and was really thirsty. She had wanted orange juice. She had drank A LOT. She was laying in her toddler bed, moaning. Finally, she threw up. And then she seemed better. No fever. I decided we'd go to the doctor the next day. It was just the excuse I needed. She was exhausted and she went back to sleep. I remember asking J if throwing up was a symptom of diabetes. He looked it up and said yes. Along with irritability and excessive thirst and excessive urination. There was that sinking feeling again. In the midst of everything else that had been going on, we discovered our A/C was not working. It was getting HOT upstairs. Around 11 pm, I finally decided I was going to take Sweetpea to my parents house for the night. She was sweaty and although she was sleeping peacefully I was worried she would be uncomfortable during the night. She woke up on our way there and was in a great mood! She was excited to go to their house. We arrived and I got her in bed. Then I finally went to bed myself. My last night without D. My last night without the fear that D would take her life in the middle of the night. We got up bright and early. I made an appointment for her at the pediatrician. I took her with me to school so I could get things ready for the day. She had refused to eat that morning. I was going to try to stop by McDonald's before the doctor but we didn't have time. J met us at the doctor. As soon as they weighed her, I knew. She was 25 pounds. At her 3 year well check, only a couple weeks earlier, she was 29 pounds. There was that sinking feeling again. The doctor came in and we told him her symptoms. I also told him about her thirst and the going to the bathroom all the time. He said that the weight loss could be due to the throwing up. He checked her out and wanted us to go get a bowel x-ray. I mentioned that we had just had all kinds of blood work done and wouldn't diabetes have shown up then? He said that if she had diabetes then, she would be really sick now. Then he said they could do the test. It was quick and easy. The nurses came in. They tested her toes. A few minutes later, they came back. Said there something was wrong with the meter and they wanted to test again. (I met this nurse again, just a few weeks ago. She remembered us. You can read about it in Flashbacks.) There's that sinking feeling again. The doctor came back in. He said that the meter had read HI (a fasting bg, mind you). He told us that she had diabetes. I started to cry. I said, "See? Sometimes when I worry about something, I'm right." The rest of the visit is a blur. We started talking about hospitals and stuff. We asked to go to Cincinnati. He said he'd go call. He came back and said that they were waiting for us. He told us to go home and pack a bag for a few days. He told us to go right to admitting and skip the ER - they would be ready for us. This did not sound good. I wrote in depth about this day in the post Dx Day. We were lucky. She was in DKA. Had we waited.... Had I not asked.... She could have died. That's how serious D is. We can never forget it. And our lives changed. In that instant, everything - EVERYTHING - changed! Our lives were forever divided into BEFORE and AFTER. And so here I sit. One year later. It's cold out today. And rainy. But just like the weather, life is very different than it was a year ago. 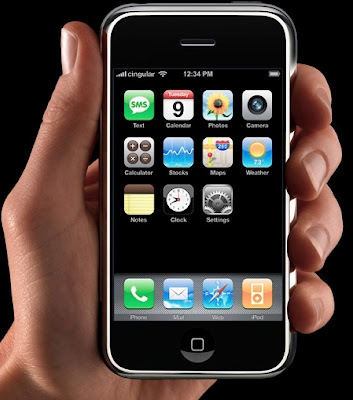 We've come a long, long way. It's been HELL. Plain and simple. Watching your child suffer through high and low blood sugar, pain and fear from injections, and the shock of a new way of life is heartbreaking. There are no words that could possibly do it justice. There is no way I can explain it to you, unless you've been there yourself. And my wish is that you NEVER have to go through this. I hope that you NEVER have this disease enter your life. I pray that it NEVER takes over your body or your child's body. But we HAVE come so far in the past year. Diabetes really is our new normal. That makes me sad. And yet, it also makes me happy. Because I know that D is not going away. And so, if it's not going anywhere, then the best we can do is learn how to live with it. And we have - we've learned to live - and THRIVE - with it. Despite everything that D does and takes away, we are STRONGER. We are CLOSER. We are living our LIVES. And on this day, one year later, I am not really sad. I am HOPEFUL. And I am GRATEFUL. And I am HAPPY. HOPEFUL that advances in medicine will continue and that they will enrich Sweetpea's life. HOPEFUL that cure will be found - one day. GRATEFUL and HAPPY that we have our darling little girl. GRATEFUL and HAPPY that she is alive. 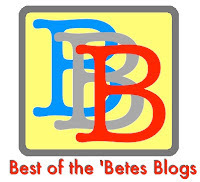 I have a guest post today! "Guess what I did today?" J asked me the other night. "I don't know... what?" I answered. "I wrote a blog post." he said - sounding very proud. "What? You did? What made you do that?" I asked. "I don't know. I just sat down and it came out." he said. As we near the first year anniversary of Sweetpea's diagnosis, I find myself in tears quite often. Maybe it's the word first in that sentence that gets me...because it implies there will be a second, a third, and so on. And that means Sweetpea's T1 diabetes is not something that will just go away. No matter how much I want it to, it's not going anywhere. 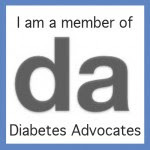 On the other hand, I am hopeful for many more anniversaries because I've read about too many parents lately who lost their child in diabetes-related incidents, and I know they would give anything to have more anniversaries. Then the tears come again because I can't even imagine the pain they are going through. And it scares me to tears that this is even a remote possibility for my family. The other night when I was lying next to Sweetpea as I was putting her to bed, she rolled over onto my chest, looked me in the eyes, and said, "Daddy, you are the best Dad in the world." Yes, once again, the waterworks started. There were tears because I felt so loved and it was such a sweet thing to say. But, at the same time, the tears were there because even if I was the best Dad in the world, there is still nothing I can do to take her diabetes away. As a guy, I want to solve problems, fix things, be a hero. But, diabetes renders me helpless in that regard. There is nothing I can do. God knows I would if I could. I remember hearing a D Mama (can't remember who it was) say her husband handled the diagnosis pretty well, but had more difficulty at the first anniversary. So, maybe all this is normal. Although, I must admit, I was a pretty big mess at diagnosis. We had driven separate cars to the pediatrician. Hallie had Sweetpea. So, it was my job to call both our parents with the news. I'm not sure I made it 2-3 seconds into those calls without losing it. After some time, I think they heard the words 'Sweetpea' and 'diabetes' and put two and two together. At the hospital, we did a pretty good job of keeping things together, mostly because we didn't want to scare Sweetpea. But, when my college roommate/best friend, who also happens to be a pastor, came to visit and pray with us, I fell apart when he gave me a hug. I still remember having no choice but to let the tears go. Sweetpea still refers to Scott as "the guy that made Daddy cry at the hospital." Which is kind of funny! Along this new journey, though, it's not all sad and gloomy. Actually, there have been even more reasons for tears of joy. 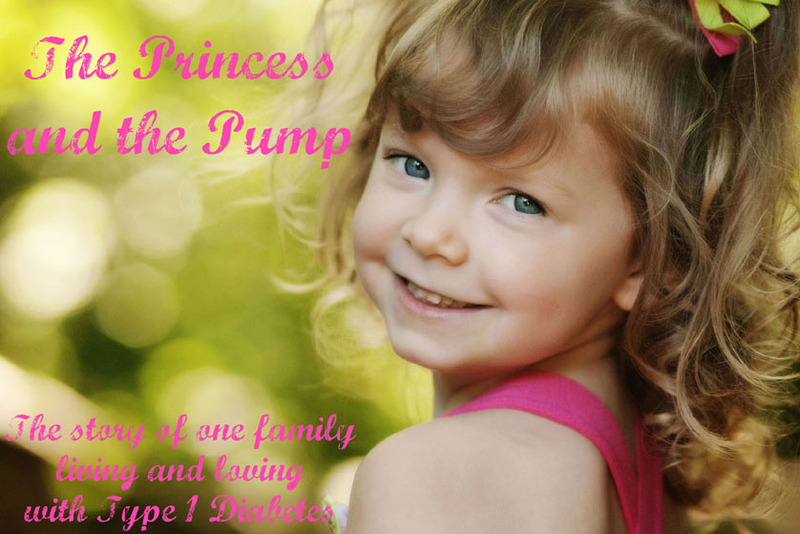 Finding out at the hospital that Sweetpea was going to be ok. Getting insurance approval for an insulin pump. Finishing our first lunch together after hooking Sweetpea up to the pump and not having to give her a shot. Hearing from Sweetpea's teacher after their World Diabetes Day celebration, that it was like Sweetpea had been waiting for that day to come out of her shell and tell her class about diabetes and show them her pump. Experiencing our first JDRF Walk for the Cure with over 40 walkers supporting Sweetpea, and raising over $12,000. Seeing how our family is even closer than it was as we travel this road together as a team. 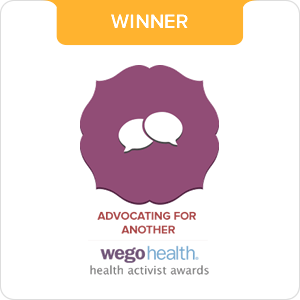 Having Hallie find the awesome Diabetes online community, which has been an incredible source of information, strength, love, and encouragement (thank you all so much, by the way!). Watching my wonderful wife touch others with that same love and encouragement. Knowing that our God is in control and He is with us. And those are just a few off the top of my head. It's ok to cry, no matter the reason. Happy or sad. Let it out. You'll feel better. I do. As we were sitting at DQ last night enjoying some tasty treats, we got to the point in the meal where J and I look at each other and say, "So how many carbs was that?" This led to me reflect on the fact there are some things I've grown to love over the past year with the big D. Not one to be selfish (at least not with information. Chocolate - Maybe. Covers - J says yes), I decided to share with my wonderful D family in hopes that if you don't already know this stuff, it will help you out! This website ROCKS. It's the best nutritional calculator that I've ever seen. You can go in and get carbs for whatever you want. Need just the cone carb amount? It's there. Need just the ice cream? There. Need just the candy topping? It's there too! And you can even mix and match to get the carb count for an entire meal! I LOVE this! This was a life saver for us shortly after dx when we were not comfortable guessing carb amounts. Plus, I use their info as the standard if we get ice cream somewhere else. How awesome is this?!? I wish every place put the measuring information on the side of their cups! OH MY SUPER YUM! It's not any surprise that Sweetpea LOVES her some cheetos! The only thing I could get down my throat the first 3 months of pregnancy was cheetos and spaghetti o's. Gross, I know. But it kept me from puking! These days, I really hate the fluorescent orange cheeto fingers and the fact that there is no way that color could be found naturally anywhere. I'm just starting to get into this "whole food, all natural, organic" life style. So finding these was AWESOME! They are super good! They are all natural. And they are very low carb! Trifecta! I love this lancet! I love that I don't have re-load every time. It contains a drum of six lancets - you just turn to advance to the next one. I love that they are sealed - so you don't need the sharps container. I love that it is pretty painless. We had to switch from the Accu-Chek meter when we got the pump to the One-Touch. 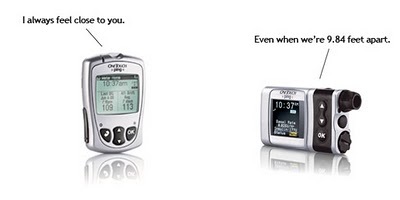 We like the One Touch meter - but still use our Accu-Chek 'clicker'! I might love this a little too much. I love it for LOTS of reasons but this is how it relates to D, so..... I love the Nutrition App that we downloaded for free! It's my go-to for carb counts. I LOVE being connected to the net all the time so that I can google carb counts if needed. I LOVE the alarm feature so I can take it with me if I have to sleep in her bed, if I have to set it so I can re-check after a middle of the night low without fear of falling back to sleep, or whatever. I wish I didn't have to wake up in the middle of the night, but since I do, it's a nice feature. Is this not the cutest thing EVER?!? 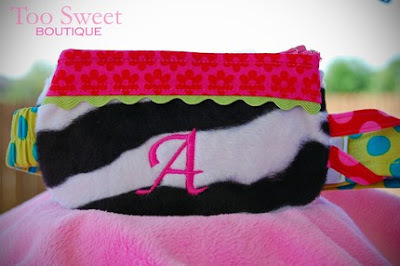 I love how this D-Mom decided that current pump pouch fashion was "lacking" and made her own super cute stuff! I sure wish I could sew like that! We ordered one for Sweetpea for her 1 year D Anniversary. I can't wait to get it! 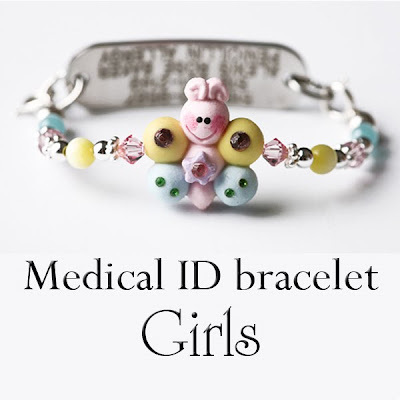 This is where I got Sweetpea's medical ID bracelets. She has one with a kitty on it and one with a princess crown. They are super cute and have held up well. She wears them ALL. THE. TIME. She even sleeps in them sometimes. I was worried at first that the cute little clay animal/design would not last - but it has! Even after almost a year of tough 3 year old play! Also, she is TINY! 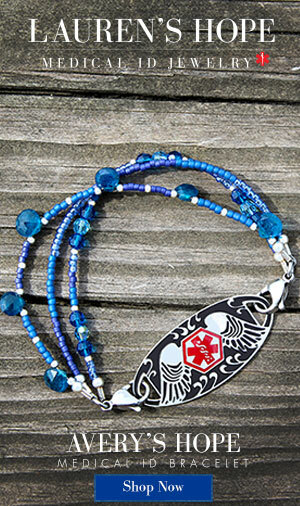 This is one of the few places that would make a bracelet for such a tiny person. This is what I use to carry our D stuff around with me. I like having another bag instead of just putting it in my purse so that if Sweetpea goes off with J, he can just take the bag. (He LOVES carrying the pretty bag!) We take it back and forth to school, to Mimi & Gaga's house - everywhere. I keep her supplies separate inside with the zipper pouches. It drove me crazy to throw everything into it and have a big mess in the bottom of the bag. So, I now have a pouch for extra pump/site supplies, a pouch for low treats, and a pouch for the vial of insulin and extra syringes. It works for me! AND - when it's hot, I can just throw in an ice pack and it will stay cool. These are ORGANIC apple juice boxes with 13g carbs. 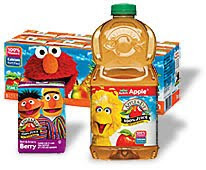 Big Bird is on the front of the apple juice. I like them because they are organic and smaller that the Juicy Juice small boxes of 15g carbs. Smaller box is better in my book. To be fair, J's gripe with these is that the straw does not go in easily. This is true. And also, to be fair, I really do like the Juicy Juice 15g apple juice boxes, too. Other than organic apple juice, both contain just about the same ingredients and are both 4.23 oz. Like I said, I'm still pretty new to this whole "natural, whole foods" thing so I really can't compare the nutritional/health value of the two. I just know that space is limited and small boxes are good! That's all I can think of right now! I'm sure there are other things I can't live without, and if I think of them - and actually remember them - I'll do a follow-up! We have been very busy around here! In the past two weeks alone, we have traveled to Florida, celebrated Easter, and attended a JDRF skating party! Whew! We are exhausted! So... I'm going to tell you about all of this fun through pictures! This is Sweetpea at my favorite restaurant - The Beach House! I love sitting out on the deck, listening to music and watching the sun shining or setting over the ocean. Sweetpea was here for the first time at 8 weeks old to celebrate my 30th birthday! Sweetpea's favorite part is going out and playing in the sand after dinner! We took Sweetpea to her first dinner at a Japanese Steak House! Here she is enjoying dinner with Mimi! She really liked using the "tweezers" to eat her food! Sweetpea is standing out on the dock that looks out into the bay. You can see the mangroves and some of the condos in the complex where we are. She and Gaga were looking for Gators! Here's the bathing beauty at the pool! Here we are at another one of our favorite places to eat. This place is called "Skinny's". You would not be skinny long if you ate there too often. They have great burgers! You cant' let the looks of the place fool you - it's a little shack - literally a shack - on the beach. There are no "windows" - just chicken wire. Lots of sand. But it totally ROCKS! My two favorite people out on the pier waiting for dinner! It was windy that day - and the wind was cold. But - we did see a dolphin! It came up VERY close to the pier and was showing off for us! It was the closest I've ever seen a dolphin in the wild. We could have jumped off the pier and touched it! This was taken while playing Mini-Golf! Sweetpea loves mini golf! She doesn't have a lot of patience yet but she has a good time! A very exciting part of our trip was meeting D Mama Lora and her kiddos in real life! Here are Justin, Sweetpea, and Leighanna! Here we all are! We met for dinner and hung out at the mall! It was really like meeting a friend for dinner - not meeting someone that you didn't know! She is as sweet as she seems from her blog! And her kids are DARLING! Justin was so brave getting his insulin shot and he dealt with all the D stuff with such maturity! It was fun for Sweetpea to see another kid with diabetes - but it was more fun for her to play two new friends! She LOVED them both! They ran around and played like old friends, too! And she talked about her "new friends" for the rest of the trip! In fact, she still mentions them and definitely wants to see them again soon! So do I! Thanks for meeting us, Lora! It was such a neat experience to meet in person! Sweetpea's favorite part of this mall is the indoor carousel! It's this two floored carousel that sits in the middle of the mall - and is a big draw for the kids! It goes kinda fast - so the adults take turns riding with Sweetpea so we don't puke! Sweetpea wanted to go to the beach like none other! It was cold the first couple of days there but warmed up nicely. The ocean water was FREEZING - but the beach was great! It was a great trip! We were able to relax a little. It was so nice for me to be able to focus only on D - and not have to worry about work! I didn't feel the panic that I do at home when her numbers are crazy and I know I have to get up and go to work the next day. I felt much more calm and I think that helped me make better D decisions, too! The best part was that her numbers ROCKED! I don't know if it was the increased activity or the warm weather or what - but we had GREAT bg's! That was a wonderful gift! Even on vacation, D follows you everywhere. There really is NO vacation from D. But, the least it could do was cooperate and that it did! Mostly. We had one low on the way to the aquarium which made for a quick visit. She had been talking about going to the aquarium forever (we go every year: Mom and Dad have passes). So it was a little disappointing that she just didn't feel good and really wasn't interested in looking at anything. But - we can go again! We had a kinda scary low one day after she drank some fresh squeezed OJ from the orange grove. She was also eating at the time and we bolused for all of it after she was done. She shot up to the upper 300's about an hour post bolus. She was not feeling well so we checked. Then about an hour later she had fallen to about 130. We had checked at that time because she just was not acting right and we thought she was low. Not low - but falling fast. Actually, much faster than we thought! Only 20 minutes later, we checked again and she was 40. Whoa! Major crash! Glad we caught it - but no more fresh squeezed oj! We also had a low (43) on the airplane. That was a little freaky - just to realize that we were confined and that there was nothing anyone could do if something happened. I had a million supplies so it was fine. She had a little juice and crackers and came up nicely. It was a little awkward to try to test and treat as the plane was landing in very windy weather... but - you do what you've gotta do! We had a wonderful time and look forward to going back soon! The day after we got home was Easter! The Easter bunny visited our house and left Sweetpea some really cool treats! He left Easter eggs hidden all over our house! Inside the eggs were coins! Sweetpea was excited to go to Target and buy something with her money! She also found an egg or two with m&m's. She didn't even notice the lack of major candy! She got a few m&m's and kisses - and that was cool with her! She liked the little toys and coins just as much. We got dressed and went to church. Here is our little Easter Princess all dolled up and riding in style! Easter here is unpredictable. The last few years have found us hunting for eggs in winter coats with snow on the ground. This year - the weather was PERFECT! It was a warm and beautiful day! We went over to my parent's house that afternoon for dinner and ANOTHER egg hunt! It seems the Easter Bunny left her some eggs and Gaga and Mimi's house, too! It was a wonderful day! I could not have created a more perfect day if I had tried! We got to meet another D- Mom! Misty was there with her family and we got to meet her and Ally and Jessi and the rest of the family in person! Again, it's like meeting up with a friend you've known forever! Her girls are all super cute and super sweet - just like Misty herself! I'm looking forward to getting to know her even better and hanging out this summer! I know the girls are going to have lots of fun! I also got to reconnect with a D-Mom I had met a LONG time ago. We had sat together at the Walk Kick-off Lunch back in August. Her daughter was diagnosed about 16 months ago. It was nice to see her and talk again - and I look forward to getting to know her better, too! It's funny how you meet people and instantly "connect" with them. Funny of D brings us together. I'm glad that it does. It's priceless to find others who "get it". Other people who speak the same weird language. Other people who worry about the same things. Other people whose lives changed in an instant - just like yours. The D community and D-friends are the saving grace of this crazy life we lead! And I thank God for all of you every day! So, there you have it! Our last few weeks in a nutshell! We had a great vacation, great Easter, and great times with great D friends! We're hoping life calms down a little but also hoping that the D monster stays in his closet and leaves us alone a little longer! Ever wonder what it takes to be gone for a week with a diabetic child? Just to keep my child alive for 7 days. We had no problems flying with our supplies. 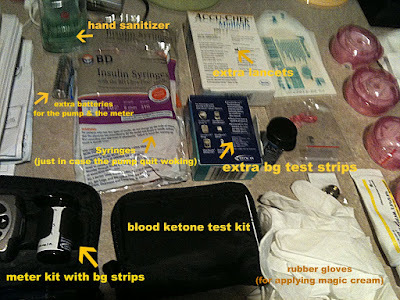 We packed everything into one bag along with the travel we got from our endocrinologist. It basically said that we needed to take certain things on the plane and they better not say anything about it or my sleep-starved, stressed-out, self could very possibly go off the deep end! Ok, so it didn't exactly say those exact words. But it was close! Airport securing in both cities were totally cool about it. They didn't even look at the letter. Supplies were fine - no questions asked. Last summer, they took everything out and looked at it, inspected the juice, etc... Not this time. We decided to go ahead and take the pump off before we went thru the machines. If you travel with a pump, keep in mind that the airport security folks don't really know anything about pumps. They wanted to put it thru the x-ray machine! NO WAY! We had to make sure that they knew that it could NOT go thru the machine and they needed to hand check it. Both places did that with no problems. You just have to stay on your toes! We also decided to suspend the pump when taking off and landing. You don't have to do this but we had heard that altitude can affect insulin delivery. Again, no big deal. 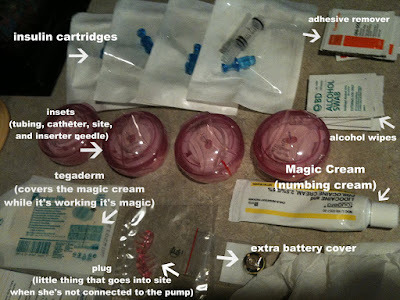 So, the biggest challenge in traveling with an insulin pump and supplies was the packing and remembering of everything! 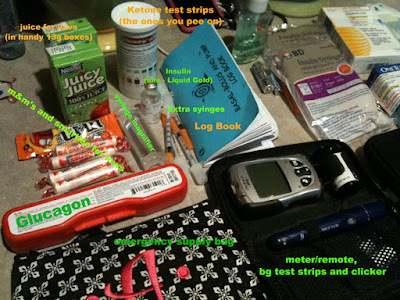 You sure need a LOT of stuff to live with diabetes! But how wonderful that we have all of this technology and supplies that makes living and traveling with D so much easier than it used to be! It might have taken an entire bag of it's own, but I'd take that any day over the old glass syringe that needs boiled and the needles that need hand sharpened!